discovering resources to fulfill our responsibility for the stewardship of creation. 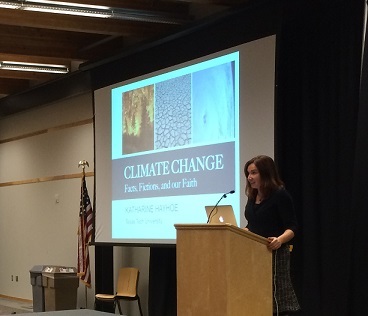 On Sunday evening, Dr. Katharine Hayhoe offered a compelling keynote, “Climate Change: Facts, Fictions, and our Faith”. Dr. Katharine Hayhoe is an Associate Professor of Public Administration and Director of the Climate Science Center at Texas Tech. She was recently named to TIME’s 2014 list of the 100 most influential people in the world and appeared in the climate change documentary Years of Living Dangerously. She co-authored a book with her husband, an evangelical pastor, Climate for Change: Global Warming Facts for Faith-based Decisions. Dr. Hayhoe particularly focuses her work on how the poor and the vulnerable are affected by climate disruption. On Monday, Dr. David Orr and The Rev. 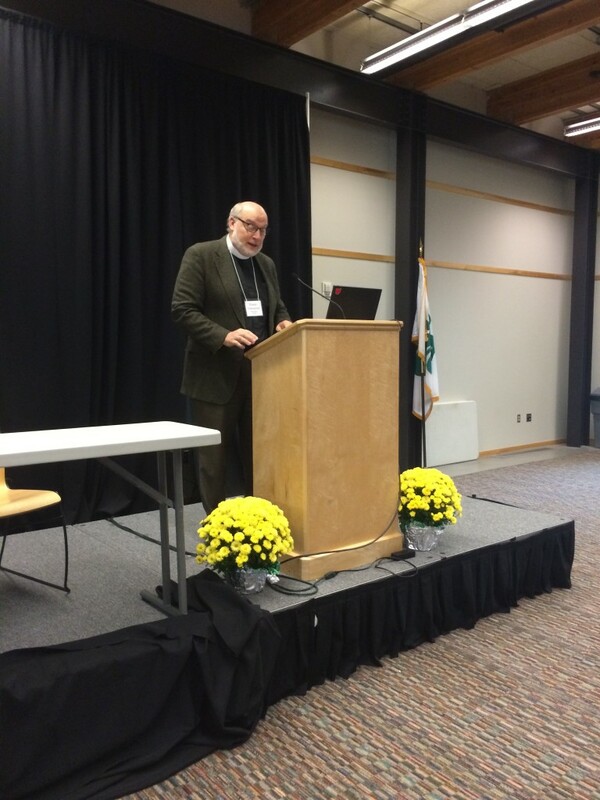 Daniel Orr offered a remarkable inter-generational dialogue on climate change. 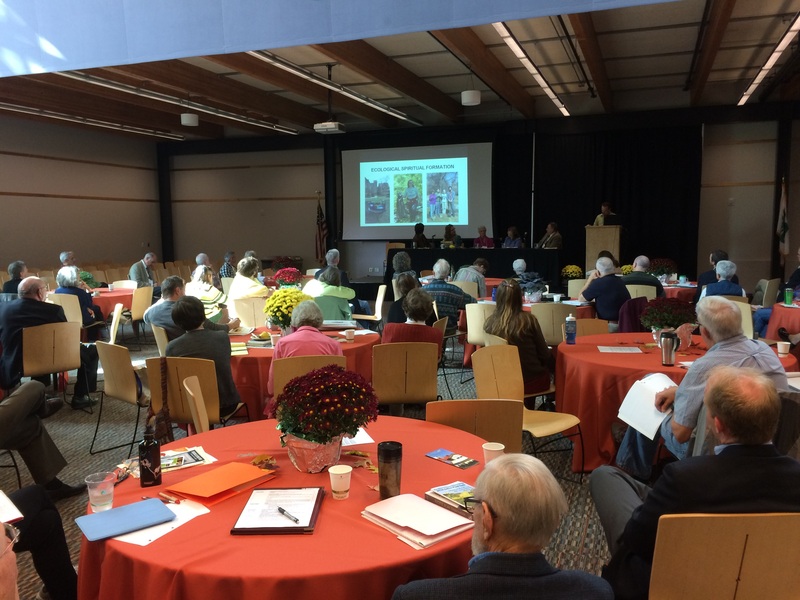 Another highlight of the Summit was the Congregational Panel Presentation where a diverse group of congregations showcased examples of energy efficiency, renewable energy, earth care education and ritual, and faith-based environmental leadership. Regional Break-out groups discussed successes, challenges, and hopes. Sara Ward, Executive Director of Ohio Interfaith Power and Light, offered special recognition to Sister Paula Gonzalez and Keith Mills as the co-founders of the OhIPL organization. The first organizing meeting of OhIPL was held on the same date (Oct. 13th) seven years ago. Sister Leanne Jablo nski offered a closing reflection and The Rev. Frank Edmands led us in a closing litany. 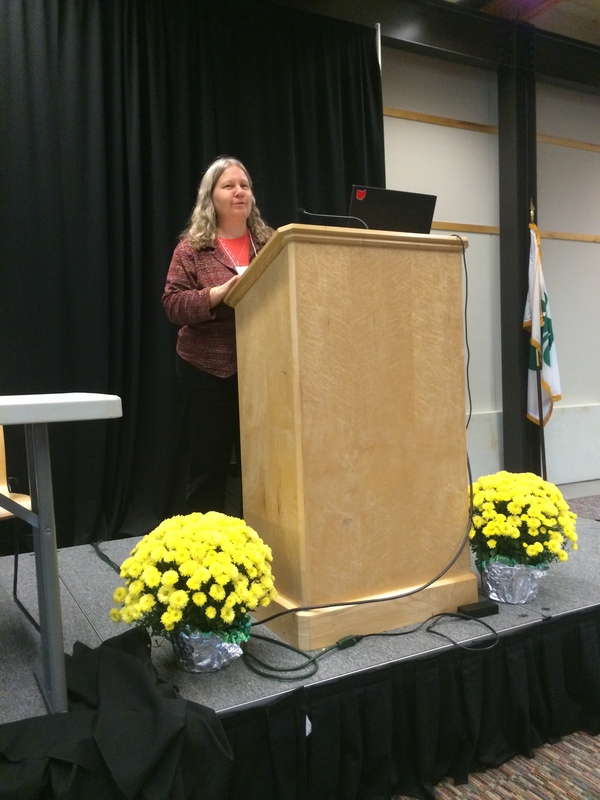 Read a wonderful article (“Faith, greens, and green buildings topics at Earthkeeping Summit”), written by Sharon Abercrombe for the National Catholic Reporter. Click here. We especially thank the following Sponsors who helped us bring the Earthkeeping Summit to you through their financial and/or in-kind contributions! The Byrd Polar Research Center, The Ohio State University: Named in honor of one of America’s most famous explorers, the Byrd Polar Research Center (BPRC) is recognized internationally as a leader in polar and alpine research. The Center’s research programs are conducted throughout the world. BPRC is known for its collection of ice core records. Foster Energy Management: A full service energy management consultant providing: Utility Bill Analysis; Walk-thru Audits; Feasibility Studies; Project Management; and Waste Management. The Diocese of Southern Ohio, Episcopal Church: About 25,000 people attend 80 congregations in the southern half of the state, including Columbus, Cincinnati, Dayton, Marietta and Portsmouth. We are a diverse group in every demographic category, from age and ethnicity to income and sexual orientation. 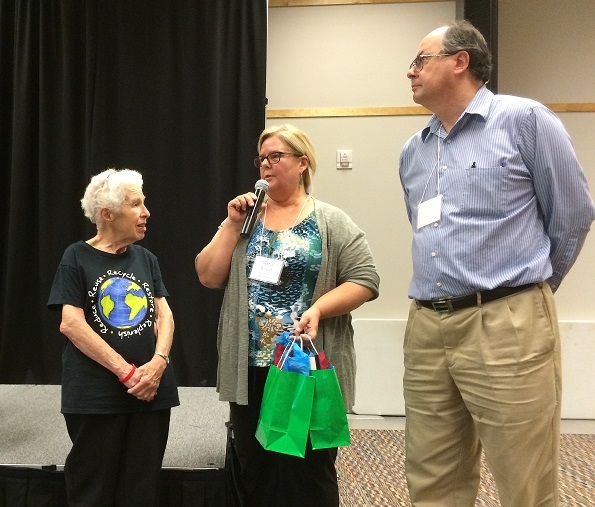 Earth Care Congregations (ECC): Forest Hill Presbyterian Church and Fairmount Presbyterian Church of Cleveland Heights (both recognized as Earth Care Congregations and active in stewardship of God’s creation), on behalf of the Presbyterian Church (USA)’s Earth Care Congregations. 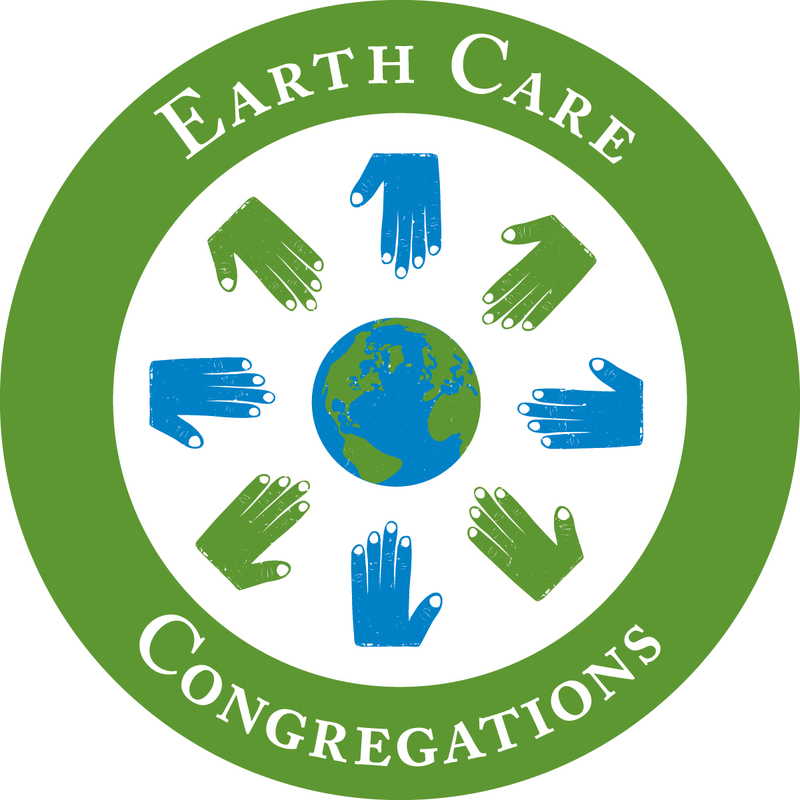 Earth Care Congregations (ECC) are congregations that have committed to the “Earth Care Pledge” and accomplished a specific number of actions toward caring for God’s Earth. ECC is a program of Presbyterian Church (USA) Environmental Ministries. Methodist Theological School in Ohio prepares leaders of many faith traditions for lives of lasting significance. In addition to the Master of Divinity degree, the school offers master’s degrees in counseling ministries, theological studies and practical theology, along with a Doctor of Ministry degree. Both the M.Div. and MAPT degrees offer Ecology and Justice Specializations. Learn more at www.mtso.edu. Columbia Gas of Ohio, headquartered in Columbus, is one of the seven energy- distribution companies of NiSource Inc. NiSource and its affiliated companies, including Columbia Gas of Ohio, has been ranked fourth out of 37 U.S. utilities in Newsweek Magazine’s “Green Rankings” of the nation’s largest corporations. Columbia Gas of Ohio’s Energy Solutions programs provide new tools to help save energy and save money on energy bills. Seminary Hill Farm: Cultivating organic produce on the campus of MTSO, Seminary Hill Farm is a place of theology, ecology and good food for all. The farm is one of the ways the MTSO community lives out its commitment to a just and sustainable world. Learn more at www.seminaryhillfarm.org. SC Ministry F oundation is a public grant-making organization. The Foundation promotes the mission and ministry of the Sisters of Charity of Cincinnati: Urged by the love of Christ, and in the Spirit of our founder, Elizabeth Ann Seton, we Sisters of Charity of Cincinnati strive to live Gospel values. We choose to act justly, to build loving relationships, to share our resources with those in need, and to care for all creation. 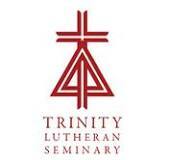 Trinity Lutheran Seminary is a school of theology of the Evangelical Lutheran Church in America (ELCA). From 1978 until the ELCA came into being in 1988, Trinity was owned and operated jointly by the American Lutheran Church and the Lutheran Church in America. Trinity has been institutional evidence of the deep unity of faith, doctrine, and life that binds all Lutherans together into one confessional family. It is meant to be a concrete expression of that unity with the mission of the whole church of Jesus Christ.